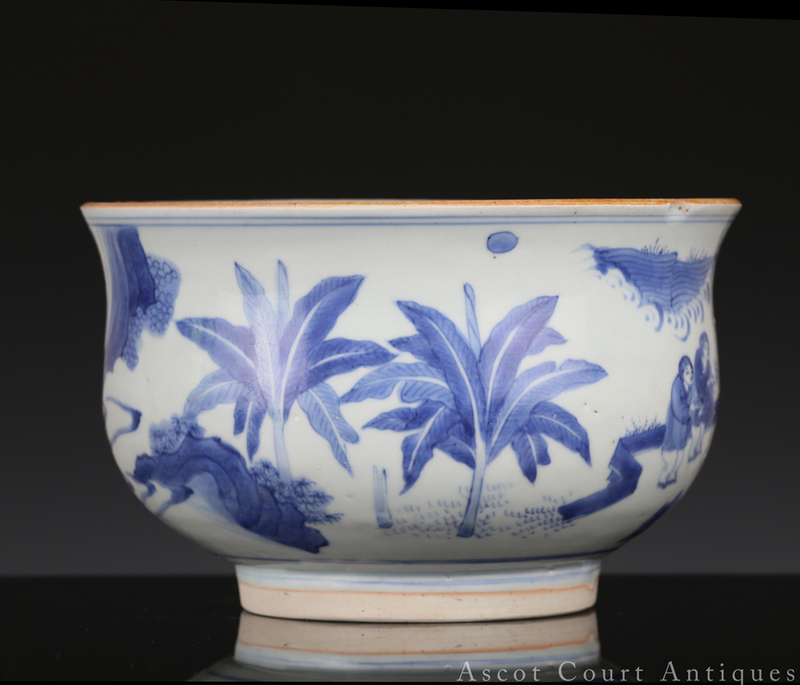 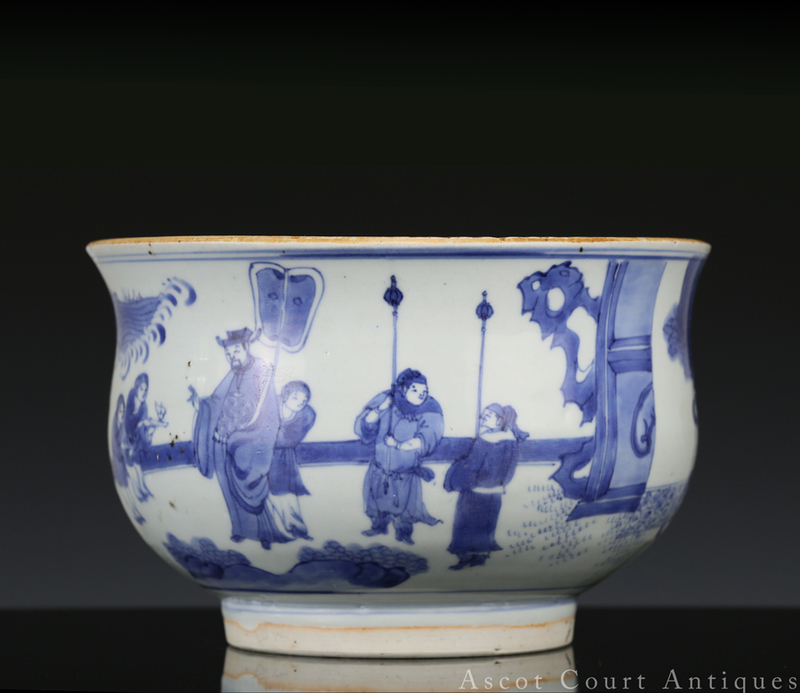 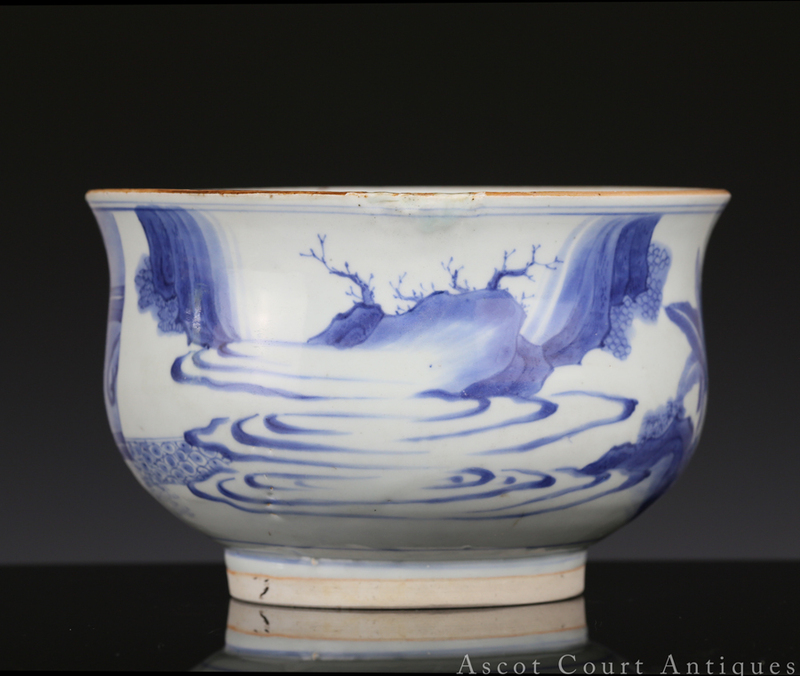 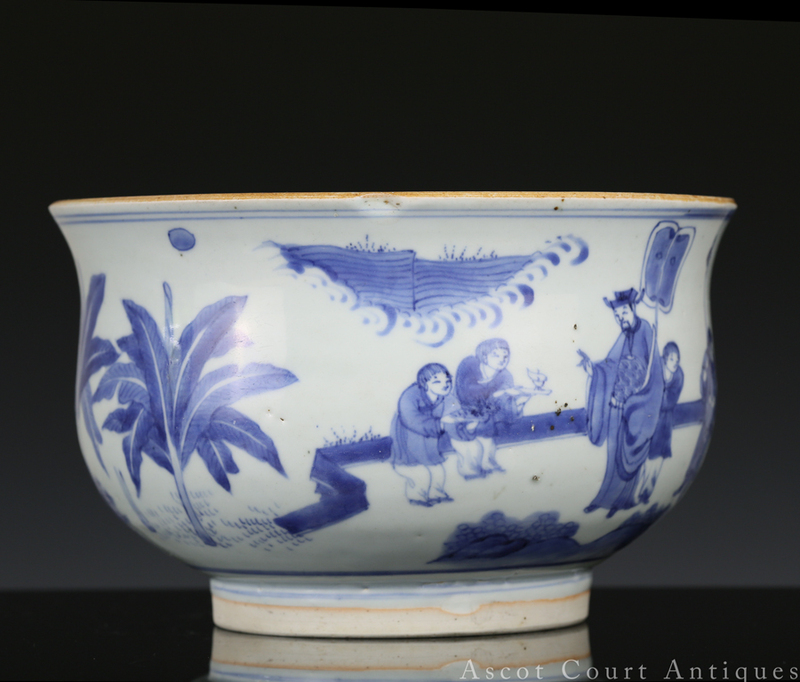 A classic transitional blue and white censer, featuring a dignitary dressed in Ming garb and attended by five servants, all in an airy landscape with clouds and rocks. 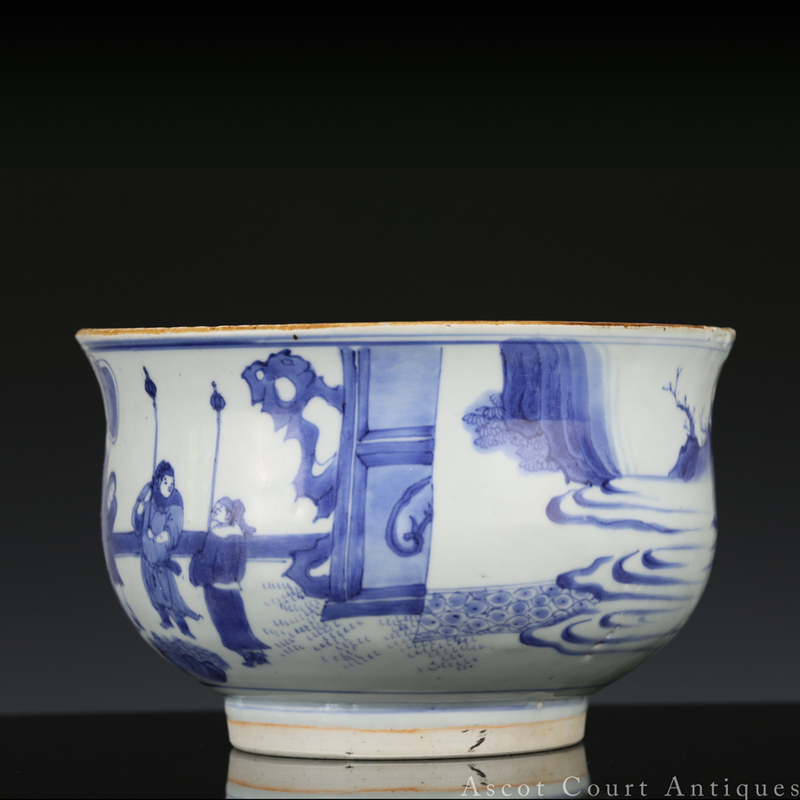 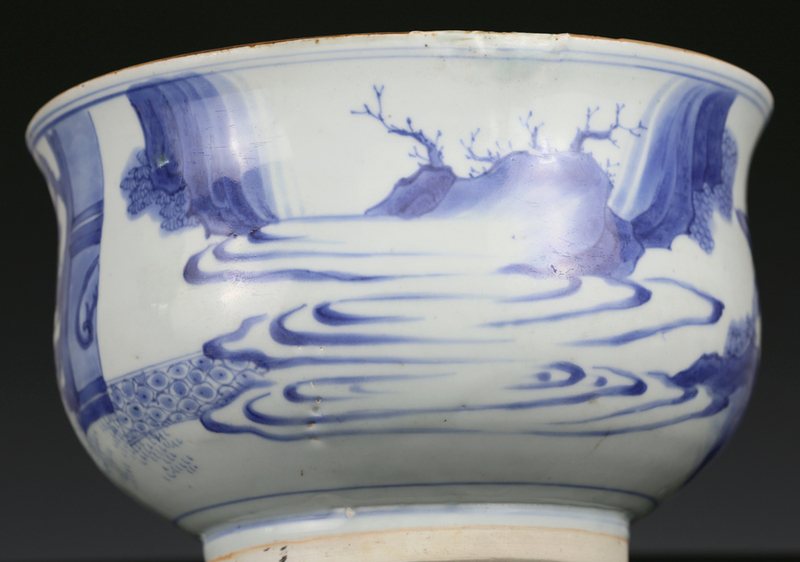 Following a period of intense crisis, during which the Ming government collapsed and left much of China in military unrest, the 17th century saw the paradoxical flowering of Chinese vernacular porcelain. 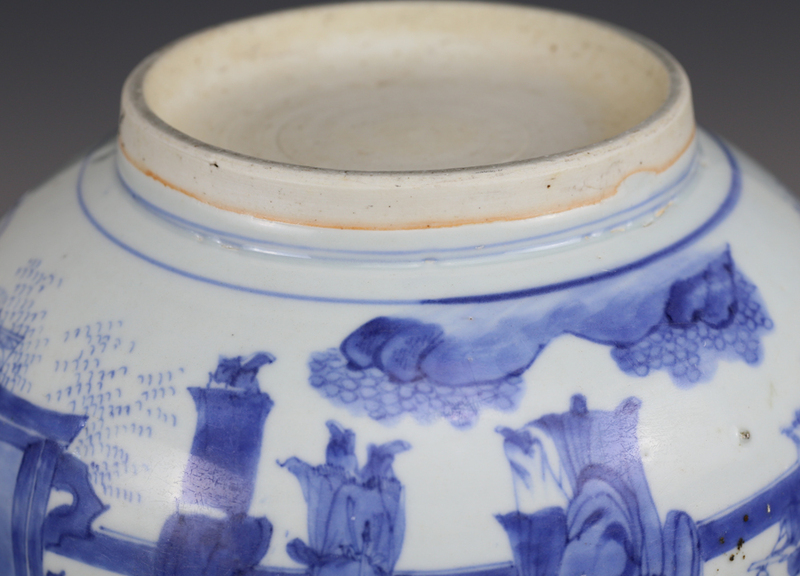 The closing of the imperial kilns at Jingdezhen meant that resources and talent could be devoted to the making of popular-taste wares for domestic consumption. 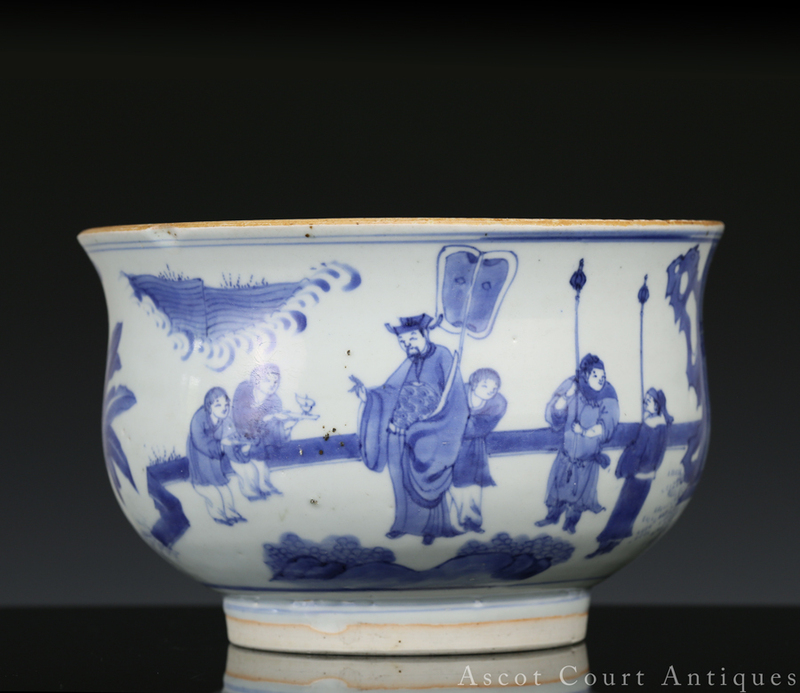 And indeed, the best transitional blue and white porcelain are engaging works of art, featuring lively and moving depictions of folk genre painting that are sadly missing from imperial wares. 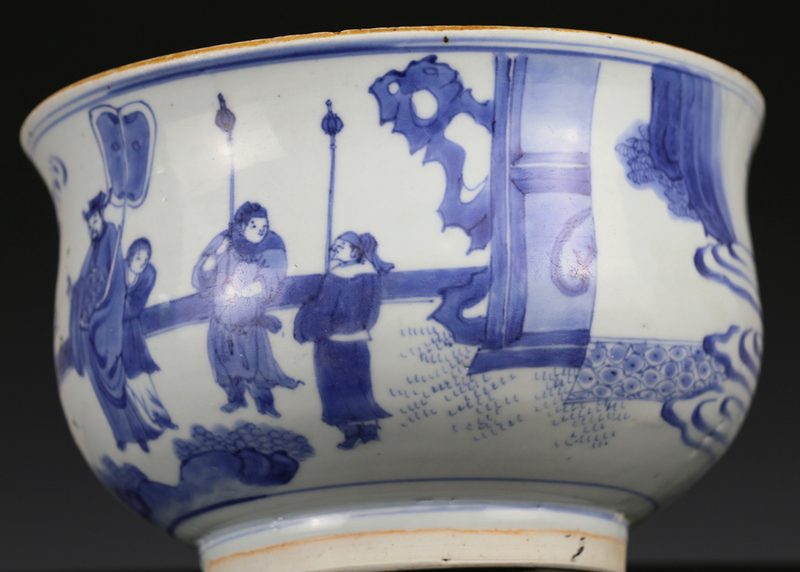 Transitional porcelain can also be seen as works of resistance and protest. 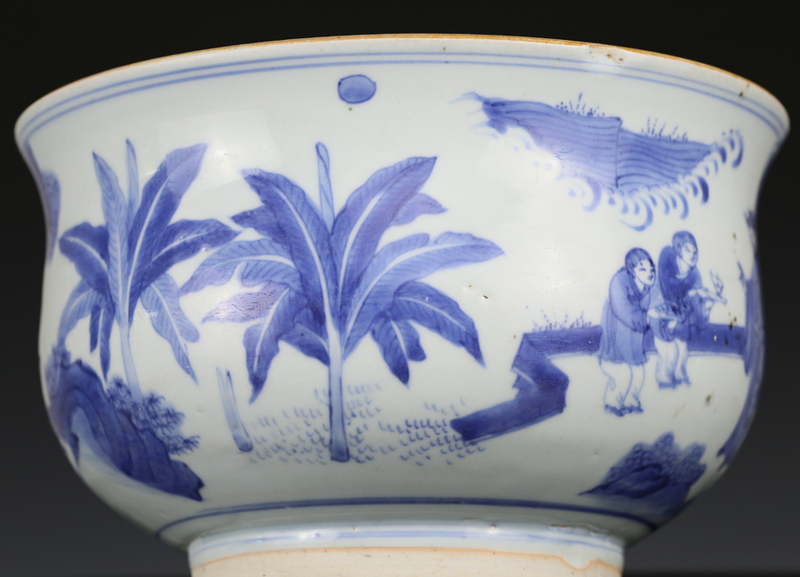 During this period, Chinese artists and literati directed their critique against the foreign invading Manchus that dismantled the Ming and established the Qing. 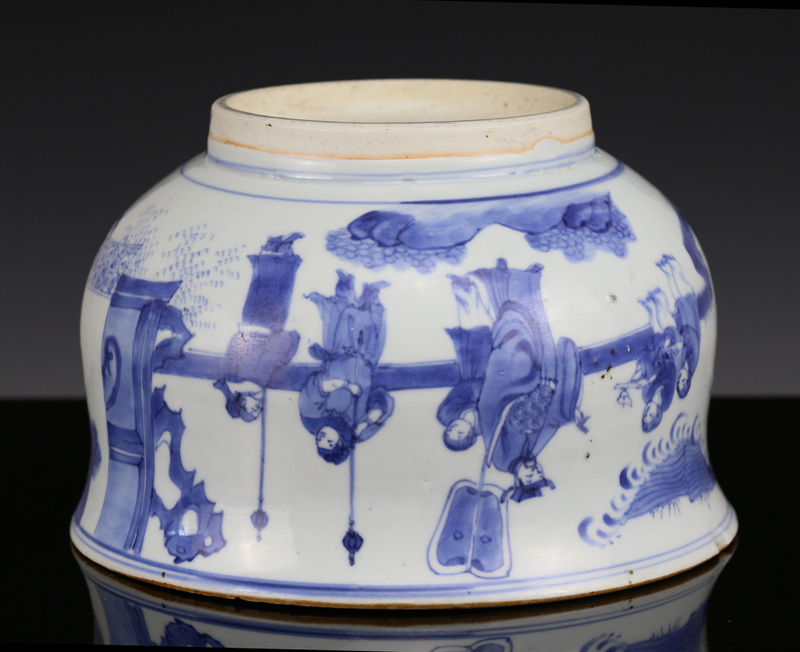 In particular, airy landscape scenes such as the one seen on this censer have a literati sensibility, full of faraway retreats and cloud-covered mountains, as if to allow the viewer to escape from the mortal realm of governments and armies. 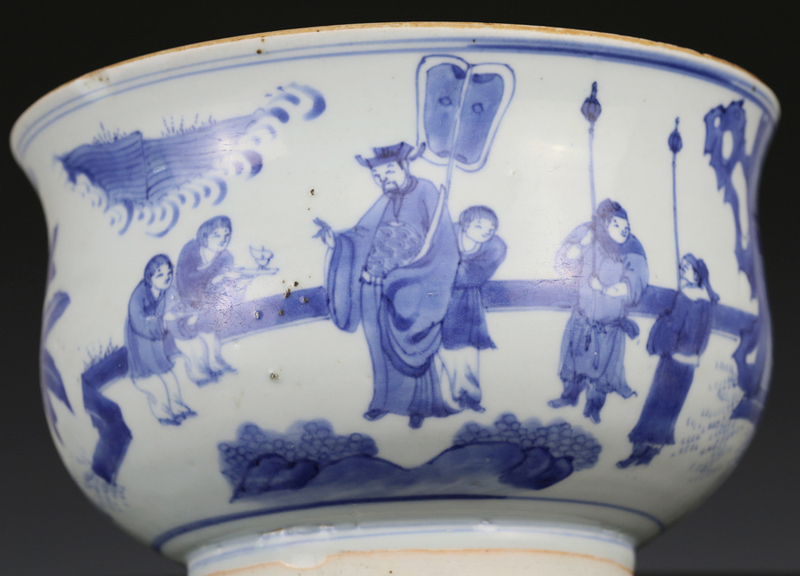 Some Ming loyalists — like the historian Zhang Dai — managed to escape and hide in faraway mountains for years during the Manchu conquest. 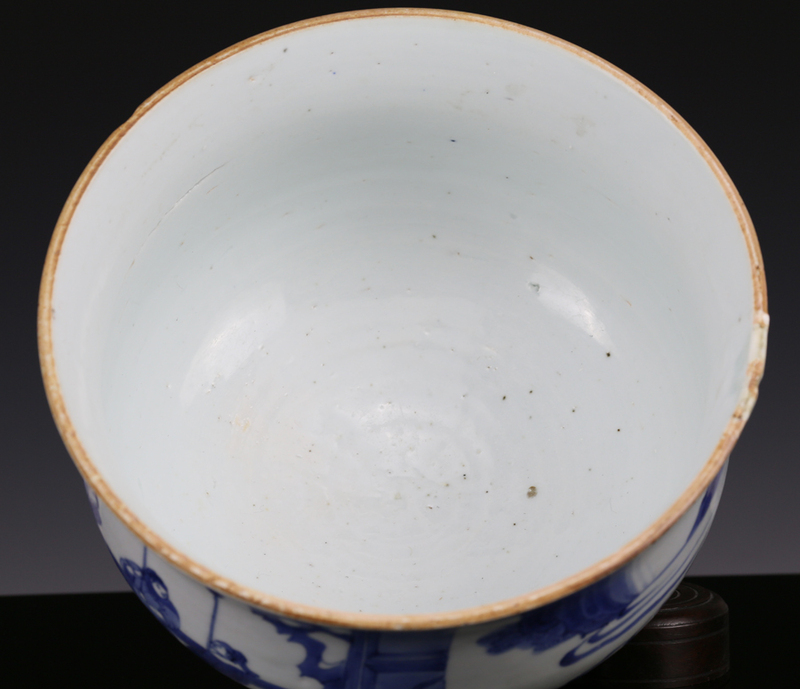 The censer is a Chinese-taste shape. 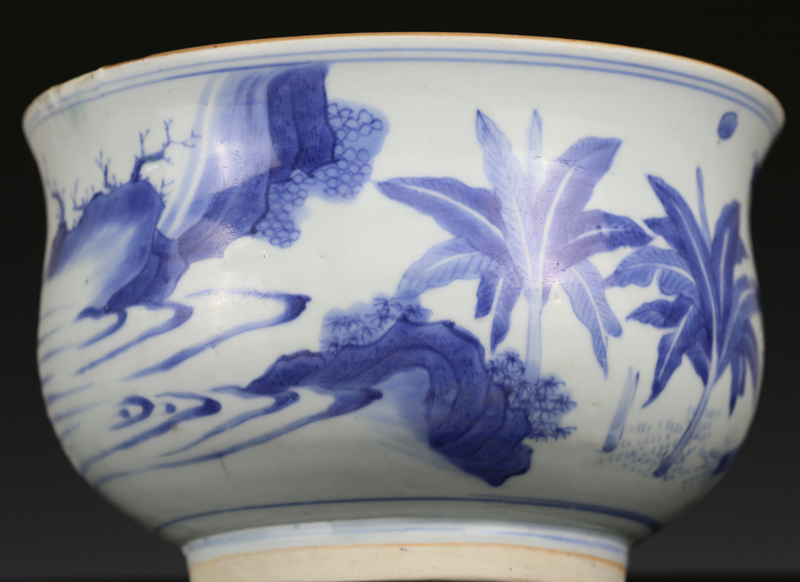 For similar pieces, refer to the Beijing Palace Museum, Shanghai Museum, British Museum, and the Butler Collection.